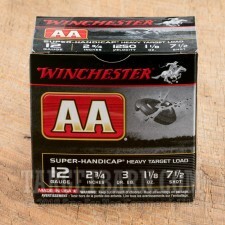 Winchester has been one of the most recognized and respected names in the shooting world for more than 150 years. 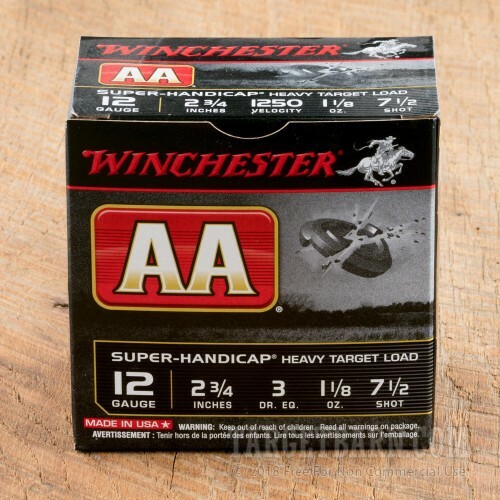 These Winchester AA Super-Handicap shotshells are manufactured at the company's newest facility in Oxford, Mississippi. 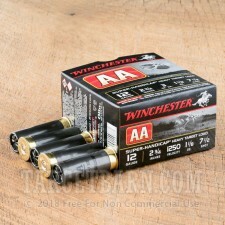 This package contains 25 rounds of Winchester AA 12 gauge ammunition. 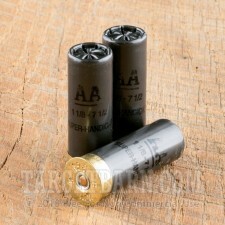 We also offer this load for sale by the case (250 rounds). You can find the full case here. 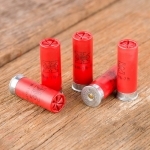 Each 2 ¾ inch shotgun shell is loaded with 1 ⅛ ounces of #7.5 lead shot. Each shell delivers a consistent muzzle velocity of 1145 feet per second and produces consistent shot patterns ideal for use in clay and trap shooting. Also, effective loads for upland bird hunting, the hard shot delivers hard hitting power and dependable accuracy, especially for longer range shooting. These new production loads feature a high strength hull for increased re-loadability, proven AA wads, and some of the best primers and clean-burning powders on the market.